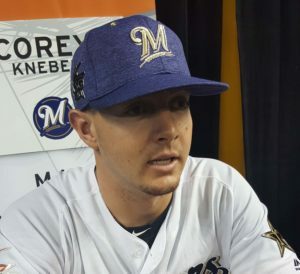 Milwaukee Brewers reliever Corey Knebel is headed for a second opinion after it was discovered he was pitching with a damaged ulnar collateral ligament (UCL). Brewers manager Craig Counsell told the Milwaukee Journal Sentinel that it’s not a complete tear, and wouldn’t likely require Tommy John surgery. It means the Brewers will start the season without both Knebel and fellow reliever Jeremy Jeffress. Jeffress is sidelined with shoulder weakness, but the Brewers expect to get him back before the end of April. Jeffress made 73 appearances last season, which is a career high. He finished 8-1 with a 1.29 ERA, striking out 89 in 76 2/3 innings. Knebel finished strong last season and pitched in nine postseason games. In 10 innings, he posted a 0.90 ERA with 14 strikeouts.